In addition to the extravagant buffets, lush accommodations, and ubiquitous casinos, Las Vegas is widely known as the Entertainment Capital of the World and for good reason. It is home to some of the most extraordinary shows around with productions suitable for adults, teenagers, families, and more. Whether you're looking for magic or music, comedy or burlesque, there's something for everyone. 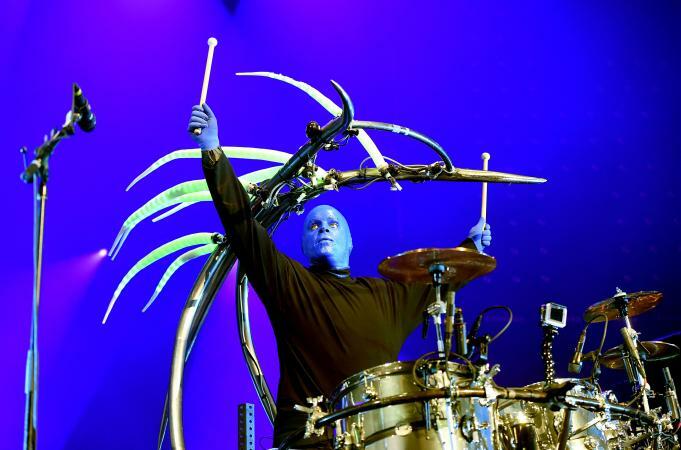 Even after more than 25 years as a production show, The Blue Man Group is as thrilling and as entertaining as ever before. Winner of multiple awards, including the Obie Award in 1991 and the Eddy Award in 2000, this stage production is filled with incredible music, stunning visual art, and performances by men in blue face paint. Second only to David Copperfield, Penn & Teller have the esteemed distinction of being one of the highest-paid magicians of 2017. Working their magic show at the Rio off the Las Vegas Strip five nights a week for more than 20 years, Penn Jillette and Raymond Teller consistently gross six figures each night. Look out for knives, fire, and even guns from these "Bad Boys of Magic." Mesmerizing attendees for more than 20 years in Las Vegas, Cirque du Soleil has grown to include more than a half dozen concurrent resident shows in Sin City. One of the most celebrated is "O" at the Bellagio. The most unique aspect is the custom-designed aqua-theater, combined with Cirque's signature acrobatic feats and mystical staging. The Chicago Tribune raved about it, applauding how they fill "the theatrical horizon with more disparate sights and sounds than the mind can absorb at any one given moment." Your heart will go on and on with the legendary Celine Dion in Las Vegas. The celebrated songstress started with her residency at Caesars Palace in 2003, selling out the majority of her shows. After a couple of breaks, she returned to the Colosseum at Caesars in 2015 with a new show that Las Vegas Weekly says "is stronger than ever." Tickets can be surprisingly affordable by Las Vegas standards, too. A staple at the Excalibur Hotel and Casino for a number of years, Tournament of Kings is family friendly dinner theater at its best. Guests are treated to a joust with dragons, live horses, and medieval personas, as well as a hearty three-course meal to be eaten with only your hands. There are a total of 22 horses in the stable and over 4,000 lance tips are shattered every year. The overwhelming majority of TripAdvisor users rate the show as excellent or very good. Danke schoen! As one of the premier icons of Las Vegas showmanship, Wayne Newton has been performing on the Strip since he was 15 years old! In Up Close and Personal at Bally's, Mr. Las Vegas walks through the audience to greet guests personally, making it one of the most memorable shows the city has to offer. In addition to hit songs, Newton entertains guests with stories and showmanship. The reviews on Vegas.com are overwhelmingly positive. A favorite among travelers on TripAdvisor, Paranormal: The Mind Reading Magic stars international mentalist Frederic Da Silva at Bally's Las Vegas. The magic show combines elements of hypnosis, mystery, and mind-reading for a truly mind-blowing experience. Be amazed by his astonishing acts as a fun afternoon show. For a celebration of the King of Pop combined with the theatrics that only Cirque du Soleil can deliver, head out to Mandalay Bay to catch Michael Jackson ONE. Get immersed in the musical world of Beat It, Smooth Criminal, Thriller, and other top MJ hits while being simultaneously astounded by incredible acrobatics, skillful dancing, and breathtaking visuals. The production won the Thea Award for Outstanding Achievement in an Event Spectacular in 2014. For a show that's decidedly more risque for the 18-and-over crowd, check out Absinthe at the Spiegeltent in Caesars Palace's Roman Plaza. The play is inspired by late 19th century European cabarets, replete with "an intoxicating cocktail of circus, burlesque and vaudeville" for a modern audience. The New York Times says it's as if Cirque du Soleil were "channeled through The Rocky Horror Picture Show and painted by George Grosz." It was even named the number one greatest show in Las Vegas history by Las Vegas Weekly. 10. Criss Angel MINDFREAK LIVE! Showcased at the Egyptian-themed Luxor Hotel and Casino, Criss Angel MINDFREAK LIVE! features the Magician of the Century as he wows audiences with some of the "most mind-blowing, revolutionary illusions in the greatest magic spectacle of all time." Expect to be blown away by this follow-up to Angel's previous Las Vegas production Believe. Following Britney Spears' four-year residency at Planet Hollywood, another huge pop star has come to fill in the void at the hotel and casino property. With Jennifer Lopez: All I Have, J. Lo belts out hit after hit to adoring fans at the Zappos Theater. Both The Guardian and Billboard give the show glowing reviews. The set list includes such favorites as Jenny From the Block and Waiting for Tonight. Despite his comical and seemingly kid-friendly appearance, Piff the Magic Dragon is recommended for audiences over the age of 13. Comic magician Piff is joined on staged by a costumed chihuahua named Mr. Piffles. The America's Got Talent star now boasts a show at the Flamingo in Las Vegas that has earned a four-star rating by TimeOut Las Vegas.